Provided by "Preface - Portraits of Modern Japanese Historical Figures"
Politician. The Prime Minister at the start of the US-Japan War Talks. Fumimaro Konoe was the first born son of the Konoe family in Tokyo which headed the list of five families that make up the Fujiwara clan. Konoe originally aspired to be a philosopher and entered the philosophy department of Tokyo Imperial University, but soon transferred to the Kyoto Imperial University College of Law where he studied under Hajime Kawakami. In 1916, Konoe began his carrier as a politician when he became a member of the House of Peers. In 1919, he attended the Paris Peace Conference as a member of Kinmochi Saionji’s delegation. In 1931, Konoe became vice-president of the House of Peers, and in 1933 he became its president. 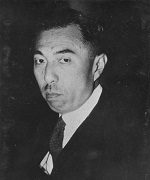 Immediately following the February 26 Incident in 1936, Konoe was asked to form cabinet, but declined the offer at this point. In June 1937, Konoe became Prime Minister and formed the first Konoe Cabinet. In July, just after forming cabinet, the Japanese and Chinese armies entered into armed conflict (Sino-Japanese War) at Marco Polo Bridge. On January 16, 1938, Konoe announced that the Imperial Government would no longer deal with the Nanking Nationalist Government, effectively breaking off diplomatic relations with China. In January 1939, Konoe resigned as Prime Minister and became chairman of the Privy Council. In June of the following year, he announced the launching of the "New National Structure Movement” that aimed to create a new nationally unified government. In July of the same year, Konoe formed the second Konoe Cabinet as Prime Minister, and in October, established the Imperial Rule Assistance Association which was a national administrative subsidiary organization approved by the cabinet a month earlier. 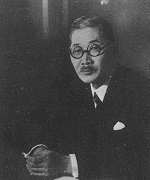 In the second Konoe Cabinet, Konoe appointed Yosuke Matsuoka as foreign minister and concluded the Tripartite Pact. In July 1941, Konoe made Teijiro Toyoda the foreign minister in the third Konoe Cabinet before resigning as Prime Minister in October of that year. Politician / Army Officer. The Prime Minister at the outbreak of war between Japan and the U.S. Tojo was the third son of an army officer, Hidenori Tojo, and graduated from the Imperial Japanese Army Academy in 1905. After entering the Army War College in 1912 and graduating in 1915, Tojo resided in Germany from 1921 to 1922. In 1937, he served as Chief of Staff of the Kwantung Army. 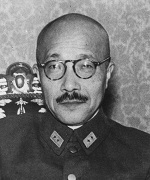 In 1938, Tojo served as the Vice Minister of War, and then, Inspector General of Army Aviation as well as Director of the Air Service Head Office. In July 1940, he served as the Minister of War in the Second and Third Konoe Cabinets. 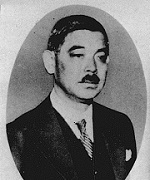 When the Konoe Cabinet resigned in October 1941, Tojo replaced Fumimaro Konoe as Prime Minister (and concurrently held the positions of War Minister and Home Minister). The Tojo Cabinet pushed forward preparations for war while continuing negotiations with the US, and on December 8, 1941, Japan entered into a state of war with the United States. Politician / Diplomat. The Minister of Foreign Affairs at the time of the Japan-U.S. War Talks. Matsuoka was born in Yamaguchi, and from the age of 12 to 22, he struggled through school in the US while working as a dish-washer. After graduating from Oregon State University, Matsuoka returned to Japan in 1902, and in 1904, passed the Foreign Service Examination. Beginning work as vice-consul in Shanghai in fall of the same year, Matuoka spent the majority of his diplomatic career in China until he quit the Foreign Service in June 1921. In the month following his resignation from the Foreign Service, Matsuoka became director of the South Manchurian Railroad Company. Although he withdrew once from the company, he returned in April 1927 to become vice-president. In December 1932, he attended a special session of the League of Nations as the head of the Japanese delegation and made a speech demanding the approval of the State of Manchuria. A resolution refusing to recognize Manchuria as a nation was passed in the general assembly, and led to Japan’s withdrawal from the League of Nations in the following year. In 1940, Matsuoka became Minister of Foreign Affairs in the second Konoe Cabinet and was influential in concluding the Tripartite Pact with Germany and Italy in September of the same year, as well as the Soviet-Japanese Neutrality Pact in April of the following year. In July 1941, Matsuoka resigned as minister together with the second Konoe Cabinet. Politician / Naval Officer. Minister of Foreign Affairs in the third Konoe Cabinet. After dropping out of the English Department at Tokyo University of Foreign Studies, Toyoda entered the Imperial Japanese Naval Academy in November 1902. After graduating from the academy in November 1905, he worked as a military attaché in England from December 1911 until October 1914. In 1923, Toyoda became a military attaché to the embassy in England. Toyoda served as a plenipotentiary follower at the Geneva Conference on Disarmament in 1927, and at the First London Disarmament Conference in 1929. In September 1940, he became Vice-Minister of the Navy acting under Navy Minister Oikawa, and was responsible for aligning the navy to comply with the Tripartite Pact. 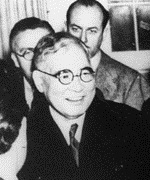 In July 1941, Toyoda succeeded Matsuoka as Minister of Foreign Affairs in the third Konoe Cabinet, and attempted to arrange direct US-Japan negotiations between Prime Minister Konoe and President Roosevelt, but to no avail. In October 1941, Toyoda resigned as Minister of Foreign Affairs along with the entire Konoe Cabinet. Politician / Diplomat. The Minister of Foreign Affairs at the outbreak of war between Japan and the US. Togo was born in Kagoshima as the eldest son of Paku and at the age of five, the family name changed to Togo. In December 1912, Togo passed the Foreign Service Examination and entered the Ministry of Foreign Affairs. In January 1923, Togo took office as Chief of the First Section of Europe and America, and focused mainly on negotiations with the Soviet Union, making efforts to conclude the Soviet-Japanese Basic Convention. In February 1933, he took office as Chief of the Europe and America Bureau (In 1934, the America Bureau was established, and Togo became chief of the Europe and Asia Bureau). Meanwhile, issues arose regarding the Anti-Comintern Pact between Japan and Germany to which Togo opposed. In October 1937, Togo began his new post as ambassador extraordinary and plenipotentiary to Germany. During his time as ambassador, issues surfaced pertaining to the buildup of the Japan-Germany Anti-Comintern Pact. Germany secretly made proposals to military officer Hiroshi Oshima rather than to Ambassador Togo. Togo was transferred and became ambassador to the Soviet Union in October of the following year, where he pushed Soviet-Japan fisheries negotiations and Nomonhan Incident Cease-fire negotiations, as well as pursued negotiations on the Soviet-Japanese Neutrality Pact In August 1940, Togo received orders from Foreign Minister Yosuke Matsuoka to return to Japan. In November, after returning to Japan, Togo was asked by Minister Matsuoka to resign from his post, but he refused to obey. On October 18, 1941, Togo took office as Minister of Foreign Affairs and Minister of Colonization in the Hideki Tojo Cabinet (Hiroya Ino took over as Minister of Colonization on December 2). Togo employed the Seventh Imperial Conference decision of November 5, 1941, the so-called "The Drafts A & B" in negotiations with the US, but failed to defuse the internal and external situation, and on December 8, 1941, war broke out between Japan and the United States. Diplomat / Naval Officer. The Ambassador to the United States at the outbreak of war between Japan and the US. After graduating from the Imperial Japanese Naval Academy in December 1898, Nomura was responsible for bringing the British constructed battleship "Mikasa" to Japan in 1901. Nomura served as captain in the Russo-Japanese War (1904 -1905). From March 1908, Nomura resided in Austria and Germany for three and a half years, and in February 1913, after returning to Japan, he served under Minister of the Navy, Minoru Saito, as an adjutant to the Ministry of the Navy as well as secretary to the Minister of the Navy in the second Kinmochi Saionji Cabinet. He worked as a military attaché to the embassy in the United States starting in December 1914 (until August 1918), at the outbreak of World War I. In 1919, Nomura participated in the Paris Peace Conference as a plenipotentiary follower, and also attended the Washington Naval Conference from 1922 to 1923, accompanying Tomozaburo Kato plenipotentiary. When the United States notified Japan of the nullification of the Japan-U.S. Treaty of Commerce and Navigation in July 1939, Nomura’s experience in US as well as his friendship with American dignitaries such as President Roosevelt and Admiral Stark were recognized, and thus he was appointed Minister of Foreign Affairs in the Nobuyuki Abe Cabinet (September 1939). As the Minister of Foreign Affairs, Nomura engaged in negotiations with U.S. Ambassador to Japan, Grew in hopes of improving Japan-US relations, however, he was unable to obtain a favorable outcome and the treaty expired. Within Japan, Nomura occasionally met opposition from the Ministry of Foreign Affairs over his position on the establishment of a Trade Ministry. At the beginning of 1940, he resigned as minister along with the general resignation of the Abe Cabinet. In November 1940, Japan-US relations deteriorated further, and Nomura was appointed ambassador extraordinary and plenipotentiary to the US. In Washington, Nomura continued negotiations with President Roosevelt and Secretary of State Hull for up to a year, and committed himself to making a breakthrough in Japan-US relations.